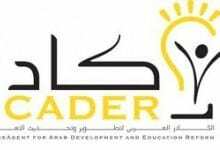 ChangeAgent for Arab Development and Education Reform (CADER) is a progressive rapidly expanding company based in Jordan and operating in the region. CADER was registered in Jordan in September 2004. It is the coronation effort of a joint Arab-European study of the requirements for education reform and development in the Arab World. CADER offers professional development programmes based on integrating ICT (Information and Communication Technology) to promote the processes of teaching, learning and working. It also offers consulting services in the field of education reform and professional development.